Lopez: ServSafe, Sofrito, more school. Lucy Gellman File Photo. Sadilka Lopez has a to-do list before she graduates high school this year. One: complete her ServSafe certification in food handling, and line up community college courses in Gateway’s food program. Two: learn more about growing her own produce, skills that she can bring with her wherever she goes. Three: teach New Haveners what real sofrito tastes like, so they’ll never be store-bought again. It’s that third one that has risen to the top of her list. 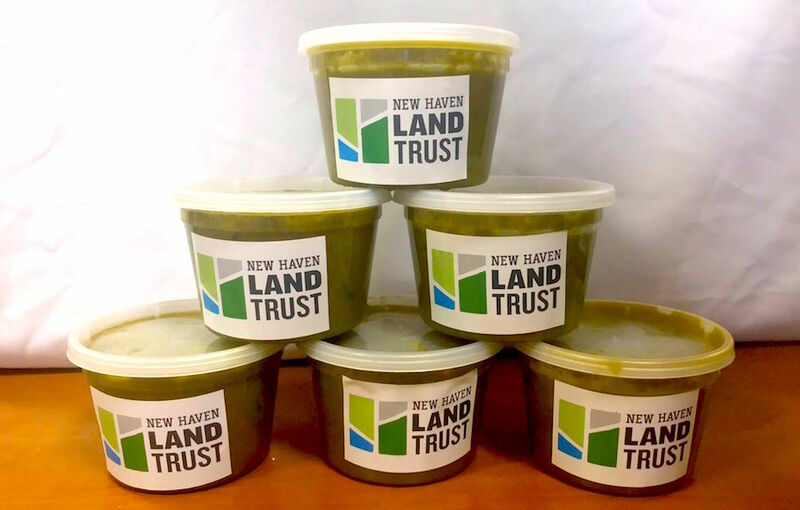 A senior at Wilbur Cross High School, Lopez is one of 11 ‘Growing Entrepreneurs’ with the New Haven Land Trust, a local nonprofit dedicated to land preservation, environmental education and community gardening. Signed, sealed ... almost delivered! The sofrito is ready to head to the CitySeed Farmers' Market. New Haven Land Trust Photo. With the support of the Land Trust last year, she embarked on a business making small-batch, homemade sofrito—a puree of green, red, and hot peppers, garlic and cilantro, salt, pepper, tomato and onions. Now, she is using it to launch a culinary career. The idea came as she was prowling the aisles of her local grocery store, where sofrito often sits in glass jars by the salsa and bean dips, or is hidden away in a questionably-titled “Ethnic Food” section. One of nine siblings and half-siblings in a Puerto Rican family, she grew up eating it as a base for meals in her home. She knew that store-bought could probably expedite the cooking process. But what she saw didn’t resemble anything out of her youth. But for Lopez, the journey to a small culinary business started years ago, during her childhood in New York City. At Christmastime, her elementary school had gone for a field trip to a cooking class, and she left with an oatmeal cookie mix. She said she can remember bounding homewards to her grandmother, with whom she was living, to make the cookies. That simple concoction of oats, cinnamon, sugar and flour opened a culinary portal that hasn’t closed since. From a cookie mix, Lopez began watching her mother in the kitchen, as she conducted a culinary ballet with sofrito-kissed rice, pork chops, tacos, spaghetti, and a special birthday lasagne. As the family moved from New York to Connecticut, she she studied her grandfather’s methods as he waltzed around the kitchen, turning simple weekday meals into works of art. Lopez (at far right) with fellow entrepenuers from her year one cohort. Ian Christmann Photo. Years later, she would remember that fish when her grandfather passed away, and she swore off the underwater kingdom because it couldn’t measure up. But as a self-described “creepy little kid” with big culinary plans, Lopez started to experiment herself, grabbing odds and ends from the pantry—eggs, Sazon seasoning, cilantro— to mix together in a pan and serve to her family. Lopez set aside time for sister-sister cooking lessons, rolling out recipes like a ground beef bacon roll that she said her sister has now almost mastered on her own. Then she turned toward her own interest in cooking, connecting with the New Haven Land Trust through New Haven’s Youth@Work program. She jumped onboard with the Growing Entrepreneurs program just as it was beginning in 2016. Sofrito wasn’t on the menu at first. Her first summer, she and four other entrepreneurs built a fence for the Grand Acres farm on Perkins Street in Fair Haven, and then worked on composting and raised garden beds. Then last summer, Lopez realized that there was a surplus of green peppers in the garden. It was around the same time that her cynicism around store-bought products was mounting. So she made a pitch to her cohort of entrepreneurs and supervisor Esther Rose-Wilen: developing a food business around an essential taste of her childhood and adolescence, that was sourced 100 percent locally. The greenhouse at Grand Acres where Lopez began her sofrito expedition. Lucy Gellman File Photo. The cooking was only part of the venture. After she normalized the recipe—green bell and cubanelle peppers became her fast friends in those months—she also learned how to balance finances, make nutrition labels, and abide by health department regulations. She moved operations into the CitySeed kitchen, splitting washing and chopping duties with her peers. Since beginning the business, she has sold batches of sofrito at local farmers’ markets, the regulation for which has been easier than local grocery stories. With her cohort of entrepreneurs, she’s expanded that product line to include kale pesto (lemon, lemon zest, walnuts, kale, olive oil) after an excess of the leafy green in the garden last year. But she also has her eyes on the future. After she graduates and completes her ServSafe training this year, Lopez wants to pursue the culinary arts full time, ultimately attending the Culinary Institute of America (CIA) in New York and owning her own restaurant. In the fall, she is considering heading to the culinary program at Gateway Community College. She knows what she wants for it, she said. A New Haven storefront, with red, black and white patterning, a garden out in the back and a jam-packed menu of all her favorite dishes. To plates already in her wheelhouse—rice, tacos, burritos, lasagna—she said she wants to add new recipes reflective of the city’s diverse population. “I like cooking. I like to eat. Who doesn’t like to eat?” she asked aloud. But, she added, the restaurant definitely won’t be called Sadilka’s. To listen to the accompanying interview, click on or download the audio above. I'm A Museum Advocate. Here's Why.